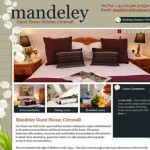 We were delighted to have been chosen to develop a new website for the Mandeley Guest House in Helson, Cornwall. Owners Paul and Birgitt asked us for a Snow Drop theme for the design. So that’s what we did. The website is developed using WordPress. The especially created Snow Drop theme runs with WordPress this allows the owners to update all their website content including guest comments.